George Goodwin was rector of Graffham between 1698 and 1709, during most of which time he was also curate at Cocking in the absence of the vicar, Josiah Pleydell, who was also Archdeacon at Chichester Cathedral. 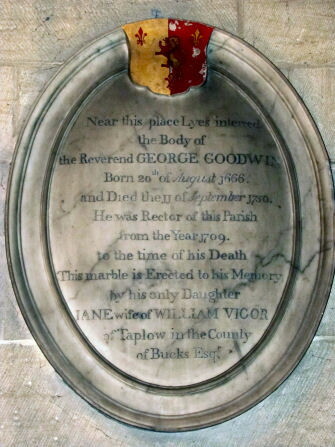 Goodwin was born at Shirland in north-east Derbyshire on 20 August 1666, the son of James Goodwin. He was educated at Westminster School, before being admitted as a ‘pensioner’Note 1 at Trinity College, Cambridge in June 1685. The following February, he ‘migrated’ to Peterhouse College from where he graduated as a Bachelor of Arts in 1689, obtaining his Master of Arts from Cambridge University in 1698/99. On 22 May 1692, Goodwin was ordained as a deacon at Bromley parish church (now the Church of St Peter and St Paul) in south-east London by the Bishop of Rochester, Thomas Sprat. Goodwin married Elizabeth Styles, originally from Southampton, at Tillington parish church on 26 June 1695. Their first child, Richard, was born on 27 August 1697 and baptised at Petworth on 9 September. George Goodwin was ordained as a priest at St Mildred, Poultry in the City of London on 20 March 1698 by the Bishop of Chichester, John Williams. Three months later, on 17 June 1698, Goodwin was instituted as Rector of Graffham by Bishop Williams; his patron was Robert Orme, who had the right to appoint the rector having acquired the manors of Graffham and Woolavington on the death of his brother in law, William Garton, in 1675. Orme was MP for Sussex from 1698 to 1700 and for Midhurst from 1705 until his death in 1711. On 20 February 1699, Goodwin baptised his second child, Jane, at Graffham. George Goodwin is first recorded as curate at Cocking when he signs the parish register for 1699/1700, which he continues to do until 1707. On the death of Josiah Pleydell in 1707, Goodwin succeeded him as Prebendary of Gates, being collated on 31 May 1708; he retained his position as a canon of Chichester Cathedral for the rest of his life. Pleydell was succeeded as vicar of Cocking by James Barker, who seems to have been more involved in the affairs of Cocking church, as a result of which Goodwin ceased to act as curate. Within a year of being collated as a canon, Goodwin left Sussex and moved to Yorkshire where he was instituted as Rector of Methley, near Leeds on 16 March 1709 by John Sharp, the Archbishop of York. His predecessor as rector, Gilbert Atkinson, had been accidentally shot and killed while out hunting in the snow. Goodwin appears to have come from a very wealthy family: writing in 1726, the Yorkshire diarist, John Hobson, describes a meeting with ‘Mr. Goodwin, minister of Medley, who had lost 40,000/- in the South Sea, and married his daughter to a Russian merchant, and had given her 14,000/- to her portion’. In 1743 a new Archbishop of York, Thomas Herring, was appointed. Soon after taking up his post he wrote to all the clergy within the diocese, seeking information about the parishes they served. The questions asked included: How many families lived in the parish, and how many people were Dissenters? Did the incumbent actually live in the parish and if not, why not? How often was communion offered, and how many people received it? In his reply, Goodwin advised that of the 148 families in the parish, there were no dissenters, although there was a ‘Papist woman superannuated’ and ‘two others are Quakers’. Goodwin advised that he did ‘reside personally upon my cure and in my Parsonage house’. He was assisted by a resident curate who was ‘duly qualified according to ye canons’. The curate lived in the parsonage and received an allowance of forty pounds a year plus ‘some advantageous additions’. The ‘public service’ was read twice every Lord’s Day and one sermon was ‘preached in ye morning’. The ‘Sacrament of ye Lord’s Supper’ was administered in the church six times a year: Christmas, Palm Sunday, Good Friday, Easter Day, Whit Sunday and Michaelmas. The attendance at the Easter Sacrament was ‘sixty or more’. Goodwin served the parish for over 40 years until his death on 11 September 1750, following which he was buried at Methley four days later. In St Oswald’s Church, Methley there was a memorial to George Goodwin erected by his daughter, Jane, although this appears to now be lost. Memorial plaque: The Remarkable Life of Jane Vigor.